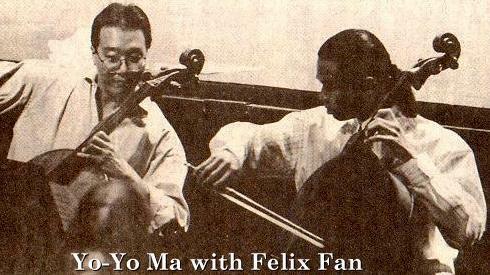 Felix Fan, 23 year old cellist, makes his home in San Diego, California with his parents. Felix was born in Boston, but his parents came from Taipei, Taiwan. Their large house has a special room that can seat 200 people for concerts, or be used at other times as a basketball court. Felix' father owns a chemical company, and plays the viola. His mother teaches strings. Felix has studied with Yo Yo Ma and Janos Starker, and recently graduated from the Cologne Conservatory. Follow the links to read the entire article in Chinese. Free web site provided by webmaster and the Internet Cello Society.